The New York Declaration called for states to ease pressure on less-developed countries like Lebanon, Jordan, and Ethiopia that host the most refugees. 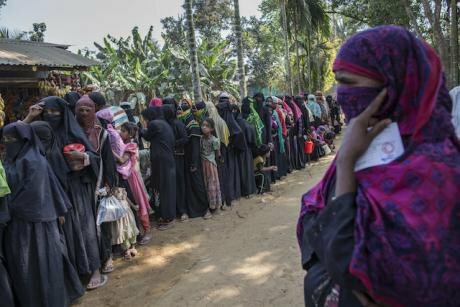 Some of the around 32,000 registered Rohingya refugees who recently fled from violence in Myanmar to the UNHCR-run camps in Ukhia, Cox's Bazar, waiting in a long food queue on March 5, 2017. 650,000 from South Sudan. Half a million Muslim Rohingya. These are the numbers that make up more than 2 million people who have joined the ranks of the world’s refugees this year. Unfortunately for them, according to the UN’s refugee agency (UNHCR) and to a new Amnesty International report, they face stricter asylum policies in Europe and the US than ever before. In a move that scored as a dismal underscore to their announcements, only days later, German Chancellor Angela Merkel agreed to limit Germany’s formerly liberal refugee intake to less than 200,000 a year. Perhaps the biggest irony embodied in this global policy shift is the fact that it comes one year after 193 UN member states adopted the New York Declaration on Refugees and Migrants, which the UNHCR called a “game changer” at the time. It’s true that the four objectives laid out in the declaration’s Comprehensive Refugee Response Framework (CRRF) represented a major achievement by consecrating basic principles of refugees’ rights and by securing commitment to cooperate more on refugee issues. The CRRF called for states to ease pressure on less-developed countries like Lebanon, Jordan, and Ethiopia that host the most refugees; to increase efforts to boost refugees’ self-dependence; to expand resettlement; and to foster ways for refugees to return home. One year on, despite the good intentions embodied in the declaration, the goals agreed upon in New York will be hard, if not impossible, to achieve without deeper action to leverage refugees’ full potential. For one thing, potential host countries, above all the US but now even Germany, are becoming more and more resistant to calls to lower the burden on developing countries like Lebanon – which already host some 85% of the world’s refuges and are buckling under the weight of the surge in new arrivals. According to the UNHCR, a total of almost 1.2 million refugees need resettling globally to third countries, but only 100,000 openings are expected to be available this year – a drop of 43% from 2016. In the past, the US has taken the most refugees classified as most vulnerable, which involves about 10 western host countries. However, the new administration has been chipping away at that legacy with gusto. In late September, Trump announced new plans to limit admissions at only 45,000 over the next year, setting a historically low ceiling. And European states, which normally set the moral standard on such issues, haven’t only been restricting the number of admissions – they have been actively sending back even those set to face persecution in their countries of origin. The number of Afghans returned from Europe, either through forced deportation or “assisted voluntary return,” has nearly tripled from 3,290 in 2015 to 9,460 in 2016, even as violence in Afghanistan has been escalating. The confounding aspect of this trend is the fact that, despite stereotypes, refugees deliver considerable returns on the small sums that host countries pay for resettlement. The confounding aspect of this trend is the fact that, despite stereotypes, refugees deliver considerable returns on the small sums that host countries pay for resettlement. Post-resettlement, they also continue contributing substantially to their home states through remittances: in 2016, the estimated $429 billion in remittances received by developing countries was three times the total foreign aid sent by wealthier governments. Unfortunately, despite the contributions that refugees make in both their adopted and former homes, those who are lucky enough not to be forcibly deported still see their full potential stifled by two main factors: slow integration and exorbitant fees charged on remittances. For wealthier states like Germany, recognizing their responsibility to mitigate the burden on host states, to accept a higher number of refugees, and to stop the inhumane process of forced deportation to war zones is a critical first step. Beyond that, there are two concrete courses of action that host countries should take to maximize refugees’ potential. First, they should make greater efforts to achieve CRRF’s Goal 2, “Building refugees’ self-reliance.” The Open Political Economy Network, in collaboration with the Tent Foundation, has laid out a number of ways to accomplish this in a new report, Refugees Work. They call for creating efficient, fair asylum systems to process applications, allowing asylum seekers with substantial claims to work immediately, and investing in language and skills training. Key to establishing these kinds of new integration policies will be emphasizing to host countries this simple fact: investing one euro in welcoming refugees can yield nearly twice that in economic benefits within five years. Investing one euro in welcoming refugees can yield nearly twice that in economic benefits within five years. To accomplish goals one and four – easing pressure on host countries and fostering the conditions to allow refugees to return – European states should coordinate with less-developed governments, especially in Africa, to maximize the power of remittances. Currently, refugees and migrants across the world rely on two main firms, MoneyGram and Western Union, to send and receive remittances. However, these companies enjoy unreasonably high market shares that they have established through the use of anticompetitive, exclusive agreements with local banks and agents. These agreements have stifled the rise of potential competitors and kept transfer fees painfully high – as costly as 14.6% in Southern Africa. While multilateral moves to reduce these fees have stalled, a few African governments have made progress by revoking exclusivity agreements and opening up the remittance market for competition. If their example were followed across the continent, the conditions that push refugees to leave in the first place would be mitigated. Unless the developed world takes more concrete steps to achieve these goals, and acknowledge their responsibilities towards the world’s displaced, the New York Declaration will remain nothing more than just that.